Limani is located in Loggos, Paxos. Our vacation rental property is air-conditioned and sleeps up to 4 people with 2 bedrooms, 1 bathroom . The Villa is walking distance to the beach and restaurants. Limani has has 2 air conditioned bedrooms. The Villa can sleep up to 4 people. There is a modern kitchen with the benefit of a full cooker and washing machine plus direct access to the sea-facing balcony. Due to the excellent beach front location there will at times be cars parked in the area at the front of the property. We had a great week in Limani - it has a very well equipped kitchen, really comfy beds, lovely shower and brilliant view from the balcony out over the harbour. The town beach is on your doorstep and is lovely to swim in. There are other beaches very close too, easy to walk to. And plenty of fab restaurants in Loggos. Maria, the very friendly owner, came to empty the bins and offer clean towels. She doesn't speak much English but we had translation help from friendly Emi in the shop downstairs (also well worth a visit). Also the bus stops right outside the house - no need for a car. It took some time to find a taxi from the port when we first arrived - good to book in advance. We would like to take this opportunity to thank you for taking the time to complete feedback for Limani. Simple, clean, well appointed apartment with a balcony to watch all the comings and goings. Perfect for our family of four to use as a base to explore Paxos by boat and car. Ideally located overlooking the harbour but not so near the busy bars and restaurants that could disturb you if you wanted to get your head down early. The adjacent abandoned soap factory is rather beautiful especially when lit up at night. We spent a lot of time on the balcony just watching people coming and going by boat and car. Endlessly entertaining. 3rd visit to this lovely apartment. Very clean an ideally situated with wonderful views over the harbour. Limani lies at one end of the tiny harbour of Loggos. The gorgeous Levrechio beach, with its own taverna, is 5 minutes walk away and other sparkling bays and coves are easily reached by small boat. You can rent your own or go with one of the local boats. Gaios and Lakka are easily reached by local bus, or taxi, and trips can be arranged to visit the fabulous Blue Caves of the west coast and the stunning beaches of Anti-Paxos. 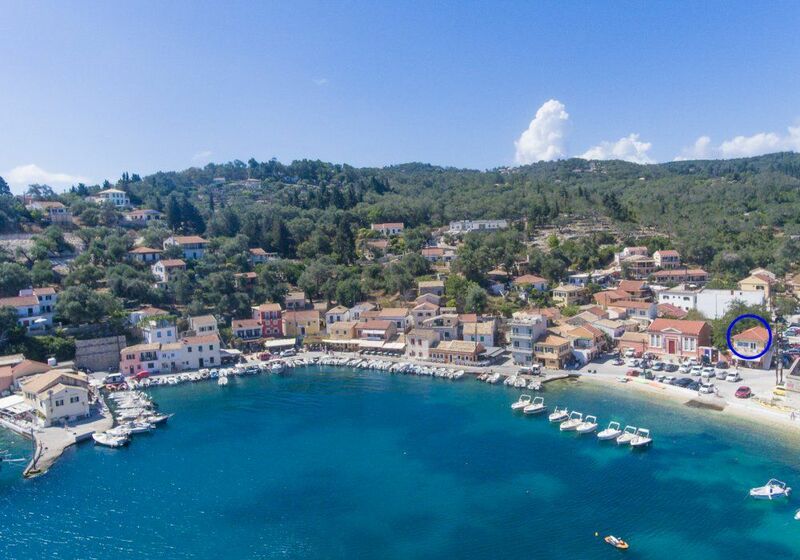 On an island famed for its small-scale beauty, Loggos stands out as one of the most enchanting places on Paxos. Visitors never fail to fall for its unique charm, and many return year after year, glad to see that the changes are negligible. You still have to get up from your taverna meal to let the local bus squeeze past and a fascinating variety of boats still bob along the curve of the quayside. The nearest beach 10 metres; nearest taverna 30 metres and mini-market 50 metres. Lakka is just 3.5 km and Gaios 5 km.